I’ve received a lot of merchandise over the years reviewing sodas. Most of it consists of the sodas themselves freely given to me so that I might review them. Sometimes I’m given hats, stickers, shirts, or the occasional coaster. 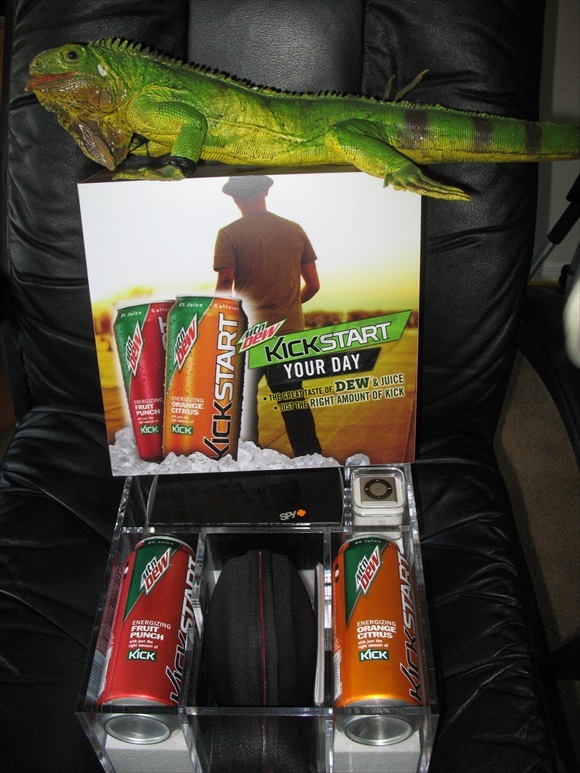 My mind exploded yesterday when I got a promotional package from Mountain Dew for their new Kickstart line of beverages. Before I continue let me explain what Kickstart is. Kickstart is basically the Mountain Dew you’re supposed to drink in the morning and you can do so with either Orange Citrus or Fruit Punch. To quote the promotional material I received it “combines the great taste of DEW with real fruit juice and just the right amount of kick to start your day.” So instead of grabbing for that cup of coffee or that tiny bottle of mediocre tasting energy drink, they folks at Mountain Dew want you to grab a can of Kickstart instead. Ok, so I’m not big on drinking sodas when I wake up, but I can’t argue that there isn’t a market for it. People drink all kinds of wake me up juice in the morning. Who am I to judge? Let me back up to what this promotional box of Kickstart held for me. The first thing that caught my eye was the iPod Shuffle, then the Spy+ glasses, then the Beats by Dre headphones. I tell you what was in the box so you know that I got swag attached to my soda. I feel it’s only fair to be truthful about these kinds of things and also believe that you should know I’ve given some of it away. Personally I don’t believe I can be swayed by material goods and I’m not saying that Mountain Dew was trying to sway me into giving a false review because I honestly believe they aren’t. The only time I would feel odd reviewing a soda is if I worked for the company that made It and in that case probably wouldn’t review it. With that said, I still felt it necessary to disclose everything attached to said swag box so you would know all of the variables before I drank this. Oh, the note attached reads “We’ve included everything you need right here to get your day started right. So crack open the can, throw on your Spys and turn up your Beats. 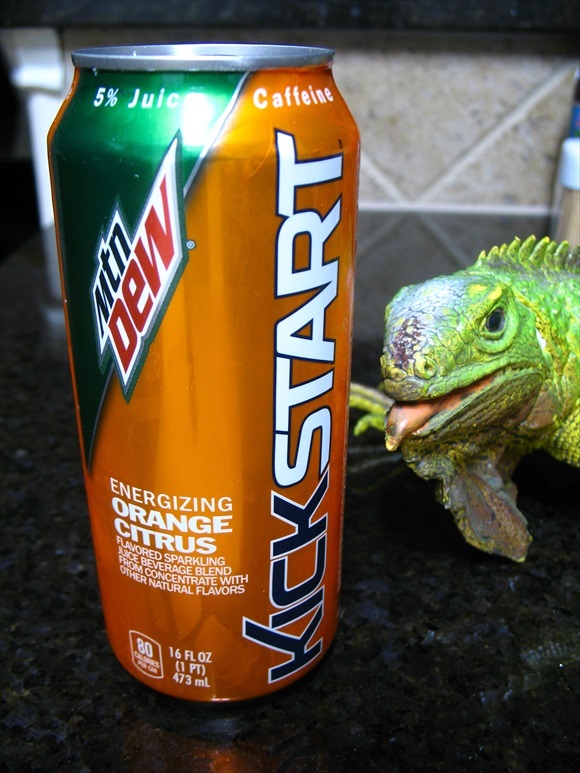 Get up, get out and let Kickstart by Mountain DEW KICKSTART YOUR DAY!” Review begins now. Mountain Dew Kickstart Orange Citrus comes large in a 16 oz. can. It’s made with 5% juice, has 100% value of the Vitamin C you need in a day, 80% B6 and a few other things as well. There are only 20 grams of sugar in this which honestly surprises me so I’m guessing the Kickstart must come from the C, B, and Caffeine included in the beverage. With a little research I find that this finds itself somewhere in the middle of the scale when it comes to comparing how much caffeine it has with other Mountain Dew types. I’m not sure I need to say it’s sweetened with HFCS, but there you have that as well. The bright orange can paired with the fact that concentrated orange juice is in the ingredients is making me wonder if this will taste anything like Orangina. I guess there’s only one way to find out. What smells like a delightfully light orange soda rushes out of the mouth of the can. The more it wafts into my nostrils the more I get the scent of actual orange juice. By aroma alone this is shaping up to be a delightful beverage. Alright, that’s not half bad. I was honestly expecting this to be a somewhat awkward missmash of orange and dew. If I’d thought about it for longer than a second I would realize that the citrus of Dew would obviously pair well with another citrus flavor. The mouth feel I initially experience is rather pleasant as it completely encompasses my mouth in tiny fizzy bubbles. A decent orange soda flavor is also present for the first half of each sip, but that’s where the happy times end. First act of Mountain Dew Kickstart Orange Citrus is like going to a local theatre group. The actors are all doing pretty well and you’re enjoying the play just fine. Sure the scenery might not be ultra-realistic, but you’re having a good time. The second act is comparable to a junior high play. Lines are flubbed, snickers are heard when the word “damn” is said, and the popular kid keeps looking out in the audience at his girlfriend. You never get fully lost in the play. What that means in review speak is that it seems like the chemicals and vitamins catch up to the flavor of the drink during the second half of each sip. My mouth is left with a little bit of a syrupy feel after I’ve taken a gulp and the residue flavor isn’t all that wonderful. The orange begins to taste like 3 year old Halloween candy and all of the fun I experienced in the first half goes by the wayside. When all is said and done I’m left with an odd tasting orange soda. Will this help me start my day awake? Of course it will; it has more caffeine than Mountain Dew. I’d have to be a corpse for this not to wake me up somewhat. Would I grab this before a coffee? Yes, but I hate coffee. Does it taste better than 5 Hour Energy? Well I haven’t had all of the flavors, but yes it does taste better than 5 Hour Energy. With all that said this site is about reviewing the taste of a beverage and ultimately this goes up against every orange soda I’ve tried and it stacks up as average. So if you want to give breakfast Mountain Dew a chance to wake you up in the morning you probably won’t be disappointed and you should check out this website. If you want to enjoy a delicious orange soda, look elsewhere.